We are avid users of Ball’s canning products, and of course we carry one of the largest online selections of their products too. Ball® has stopped selling to preservers directly, but Fillmore Container will continue to carry one of the largest varieties of Ball and Kerr jars, at the best prices. 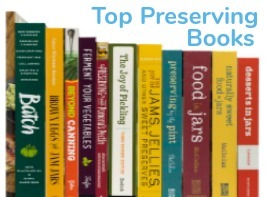 O ver the years, Ball Canning has introduced some pretty cool new tools and products that will motivate you to try something new and help you preserve more! 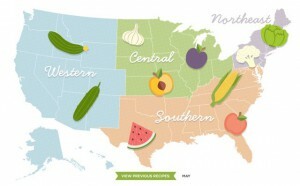 You can use this Interactive Canning Map to find out and what’s currently in season in different regions of the country. Clicking on the various images of fruits and vegetables will take you to preserving recipes that utilize those ingredients. If you need help calculating the pectin you need for your jam or jelly, use this handy pectin calculator. 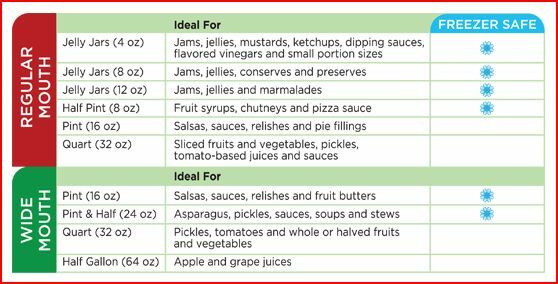 If you’re new to canning, this simple pH chart will give you guidance on pH and which preserving method will be needed. Making jelly without pectin? You can use this sheet test to determine if you’ve reached the gelling point. Don’t forget to sift through their recipes too. Or maybe you’ll want to add the latest Ball Blue Book to your cart? We are often asked which Ball products we carry, so we’ve put a list together for you. 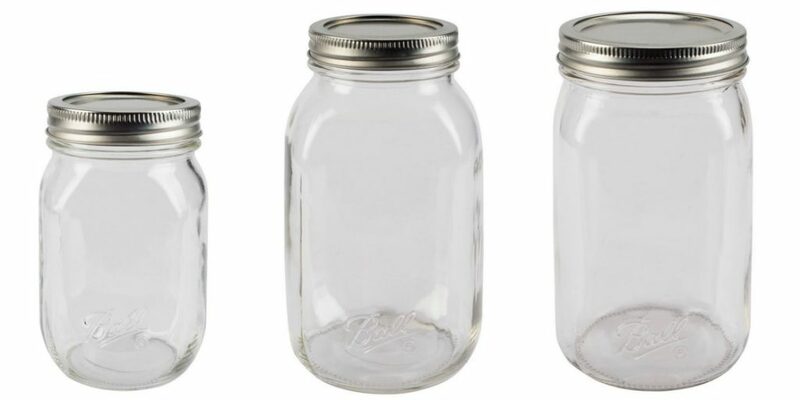 Ball’s traditional clear glass wide mouth canning jars with the Ball signature imprinted on the front of the jar are available in 16oz, and 24oz, 32oz, 64oz. The Elite Collection also offers two unique squat style jars in a wide mouth opening. 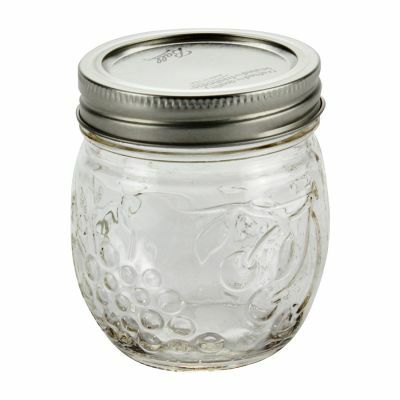 Available in an 8oz., and 16oz; as well as this 8oz Kerr jar, which is made by Ball. 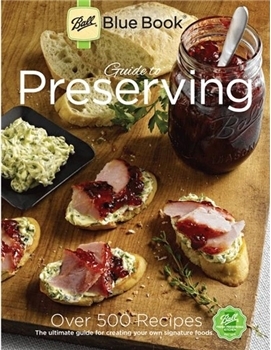 Ball’s Quilted jelly jars offer a traditional look and are an old favorite with canners. 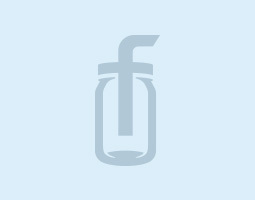 The quilted line of jars are available in 4oz, 8oz, and 12oz. and come with bands and lids. 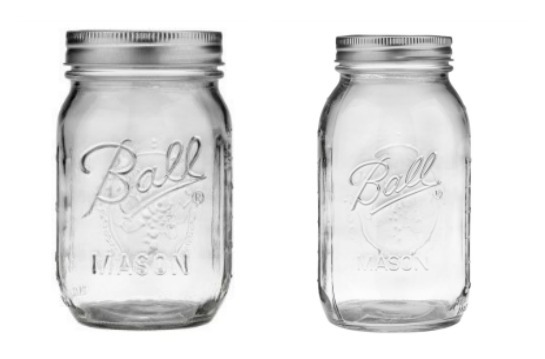 Ball’s traditional canning jar with the Ball signature imprinted on the front of the jar with tapered shoulders is available in 16oz, and 32 oz. The past few years, Ball’s been creating specialty jars that offer a different style or color than traditional canning jars. They are still safe for canning, but they are just as pretty to look at, as they are to fill! The Collection Elite color series jars offer never-before released sizes in blue glass which include – 8oz. regular mouth, 16oz. wide mouth and 32oz. wide mouth jars. Each jar is made in the USA of colored glass and is safe for water bath canning, pressure canning and food storage. Learn more about these jars here. Brand new to the Collection Elite jar line are the Amber Wide Mouth Jars available in 16oz., 32oz., and 64oz. The new wide mouth jars will help protect your preserved food from harmful food-damaging UV rays. Amber glass blocks 99% of UV rays, allowing your preserves to be shelf stable for up to 18 months. The jars can be used for home canning, storage of herbs, spices, coffee or tea, decorations or gifts. You can read more about the benefits of Amber jars here. 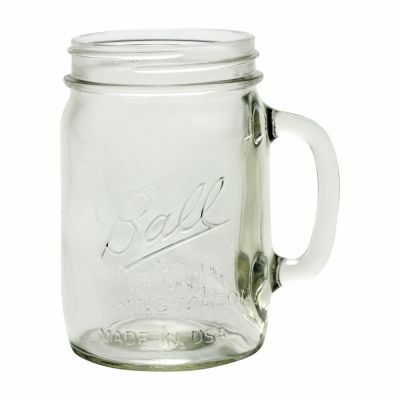 The only clear glass jar in Ball’s Collection Elite line is this vintage style regular mouth 8oz jam jar. This regular mouth jar sports a squat shape and is covered with a variety of embossed fruits. The Smooth-Sided Jar Collection from Ball offers a smooth face on three sides of the jars, with a minimized Ball logo on one side. We love it, because the jars accommodate a wide variety of labeling for preserves, increase decorating options for crafting, decor, gifting and sharing. They are available in 16 oz. regular mouth, 32 oz. regular mouth, and 32 oz. wide mouth.You can read more about these jars here. 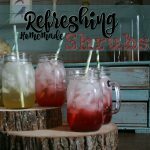 These 24oz drinking jars are ideal for water, fresh brewed iced tea, lemonade or any other cold beverages. 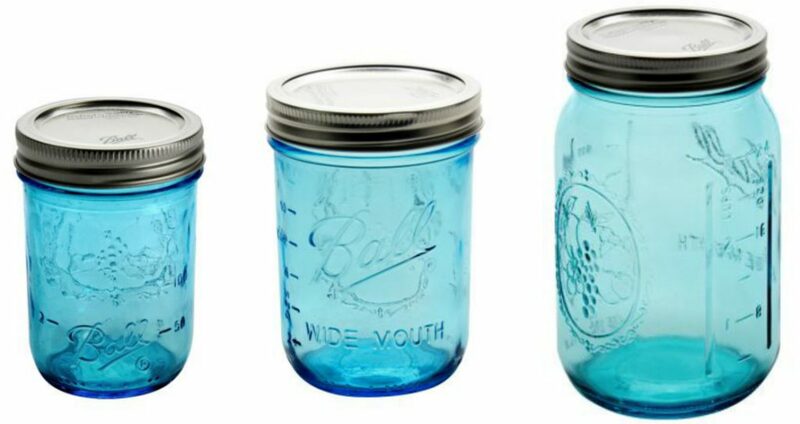 The mugs are made with the same high quality glass as Ball’s canning jars with the addition of a handle to make holding the jar easier. Made in the USA is embossed on the jar below the Ball logo on the front of the jar. Theses wide mouth mugs can be paired with any wide mouth lid include these iLid drinking lids, straw hole lids. These jars are not recommended for home canning, and are sold in packs of 4. All of Ball’s jars come packaged with bands and lids, but if you need fresh dome lids they are sold 12 to a pack, or you can purchase a combo ring and dome set sold in packs of 12. If you do a lot of canning, consider purchasing our bulk flats, available in both regular and wide mouth. They are manufactured by Ball, but are unmarked. Ball’s plastic storage lids are also a nice one-piece option when storing open jars in the fridge available in both regular and wide mouth. They are packaged 8 to a pack. If you plan to freeze in your jars, but sure you are using jars that are freezer safe. Check out the chart below to identify which jars are best for freezing. 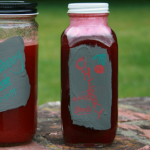 To read more about how to freeze in jars safely, read this post. 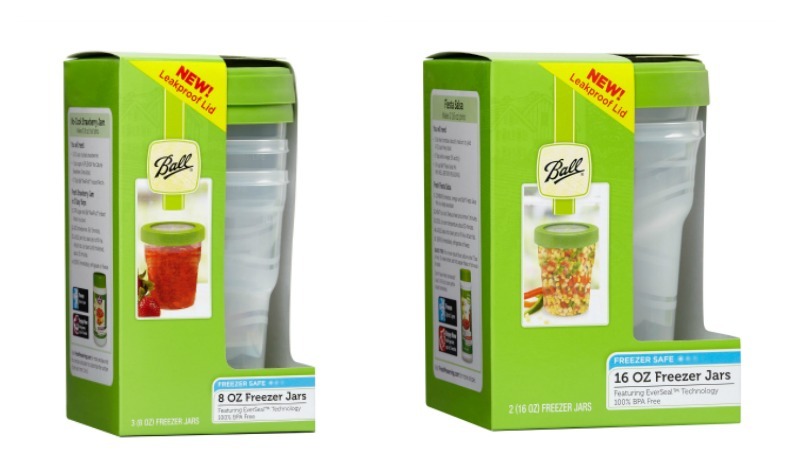 If you’re not comfortable freezing in glass try Ball’s Plastic Freezer Jars – available in 16oz. & 8oz. sizes. Ball’s entire line is not available to us through our supplier. Some of them are ear-marked for non-USA markets. Some items would be duplicates of what we carry in a more economical and/or more versatile version. Sometimes we are able to bring items in as a special order, but there is usually a minimum quantity expected in order to do so and a greater lead time. If there is a particular item that you’re interested in, feel free to ask by emailing info@filmorecontainer.com with the details.